Braised lettuce is a French classic that doesn’t seem to be in vogue as much these days. More’s the pity. 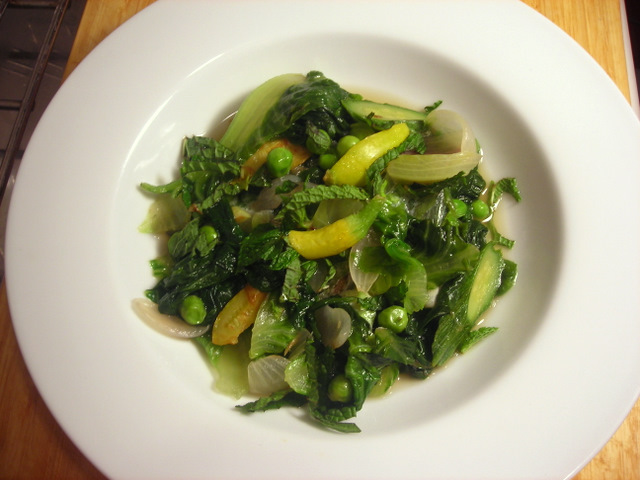 Tender leaves of faintly bitter lettuce contrast beautifully with sweet peas, pearl onions, baby squash and mint. A little French butter stirred in prior to service lends a silky richness to the finished dish. The traditional preparation uses romaine lettuce, but almost any variety of lettuce will do. Boston, Bibb, red-leaf and Batavian lettuces are all great candidates for this dish. Gently warm olive oil in a saucepan or heavy skillet over medium heat. Add shallot, onions and baby squash; sauté until tender, about 3 to 4 minutes. Add the lettuce, chicken stock and thyme. Reduce heat to low. Cover and cook for about 5 minutes or until lettuce is tender. Taste for salt and pepper. Add peas and cook for 5 more minutes. Taste for salt and pepper. Stir in butter, then serve at once. If you omit the butter and replace the chicken stock with vegetable stock, this dish becomes vegan. This is my submission for Weekend Herb Blogging #293, currently hosted by Chriesi of Almond Corner and organized by Haalo of Cook Almost Anything. Weekend Herb Blogging is a weekly foodblogging event that was originally begun by Kalyn of Kalyn’s Kitchen. 21 Jul	This entry was published on July 21, 2011 at 12:12 pm. It’s filed under food, summer and tagged appetizer, dinner, French cuisine, lettuce, mint, onion, recipe, squash. Bookmark the permalink. Follow any comments here with the RSS feed for this post.